When I was a younger woman, I dreamed of adventure. Maybe riches. Sometimes romance. I have a very vague recollection of what it was like to let my mind wander and get lost in my own thoughts. As a much older woman now, let’s just say my dreams have shifted slightly. I have adjusted to my current season. Some might delicately put it that way. But the blunt truth of the matter is that I dream of very simple things these days. Like finishing a sentence without being interrupted. Just to pop out the first one that comes to mind. Yes, yes, yes . . . I am trying to train my children in this arena, so let’s not even go there. I mean really – there are four of them, and one of me. I’m grossly outnumbered. 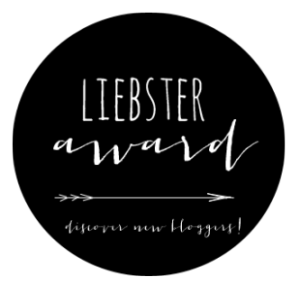 Some weeks, having fun with this blog is one of the only times I can reassure myself that I’m still capable of maintaining a train of thought. I’ve also realized that I have a new way of rating my friends in regards to this new dream. A REALLY good friend is one who, after I have had to stop mid-sentence and run after my two year old, will say upon my return, “OK, so finish what you were telling me about xyz”. That friend was actually listening and cares about what I have to say. Then there are the friends who will say nada, zilch, zero upon my return. I always wonder whether they weren’t even listening in the first place or are actually just happy the toddler split when she did because they were over what I was saying 10 minutes ago. Then there are the friends who have their own 2 year olds (or a various aged gaggle of other children) with intermittent fleeing, climbing, and falling bouts. Pretty safe to admit, that we’re basically just smiling and nodding at each other and pretending to catch even 1/10th of what the other one is saying. I know there will come a day in the future where I will wish I had a kid interrupting me. I also know that day will come sooner than I can probably imagine. I know I should make a mental recording of their angelic little voices that won’t always be calling my name (of course I would need some major sound engineering to lower out the whining, screaming, and/or sniveling). So I’ll try to keep that all in mind as I maneuver through each day. But I’ll also continue to dream my here-and-now-dream and let my reveries take me to the land of coherent, uninterrupted conversations while being surrounded by my offspring (other current dreams include reading a book on an airplane and peeing without an audience, in case you were wondering). And with that, I think I was mentioning when we last spoke (before I was interrupted) that I had this great little grape and cake combo to tell you about, didn’t I? Well let’s get back to that . Our CSA box has been bursting with grapes these last three weeks. Really delicious grapes. Autumn Royal Grapes, they are called and they come from A H Organics. After the second delivery, curiosity got the best of me and I started wondering what exactly I could do with grapes besides just rinse them and feed them to the troops as a snack or have a stomp fest in the back yard and teach a home school lesson on wine making. Well lo and behold, I found a recipe for a Moscato Cake with Grapes. 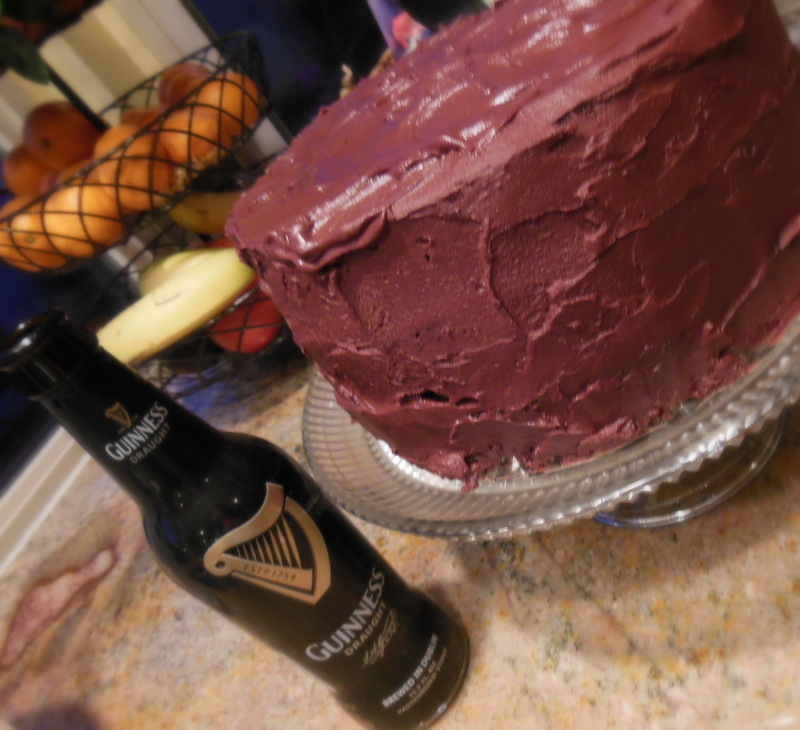 I got really excited about this since I had never made a cake with moscato, nor had I ever confectioned with grapes. So off I went. I started by brushing a spring form pan with olive oil, lining it with parchment, and then brushing the parchment with olive oil. 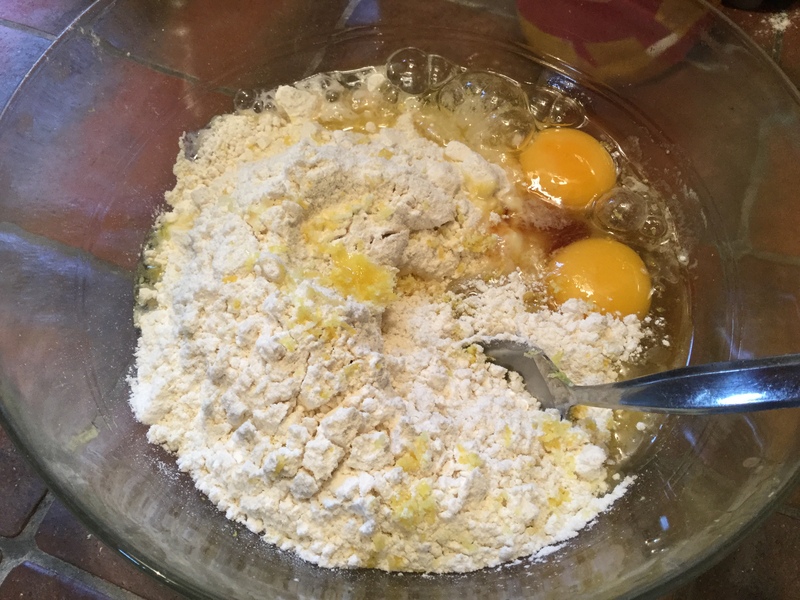 After that, I mixed some flour, baking powder, salt, and baking soda and set the dry mixture aside. 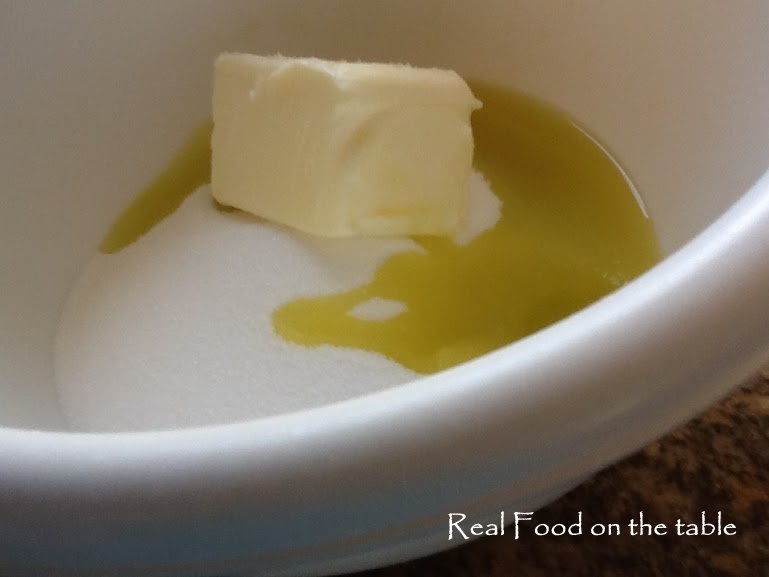 Then I whisked together some sugar, butter, and olive oil. 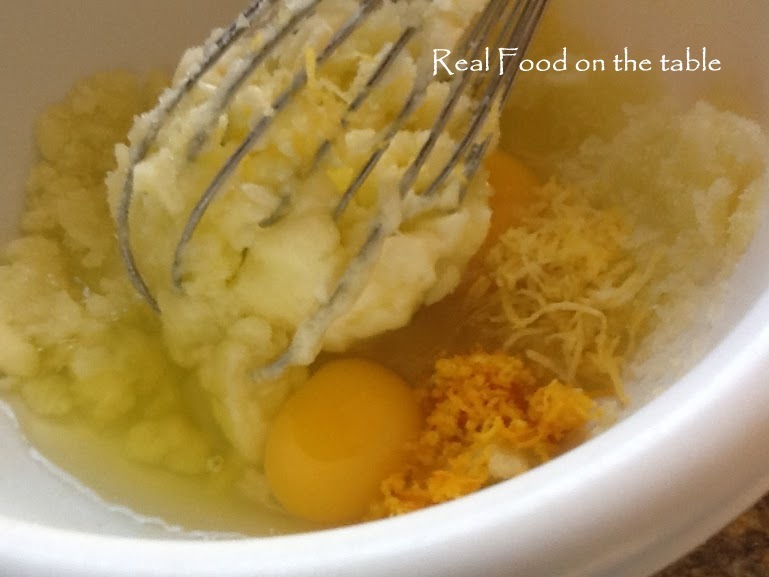 To that, I added a couple of eggs, some grated lemon peel, some grated orange peel, and vanilla. Here’s where it got fun . . . and started to smell divine. 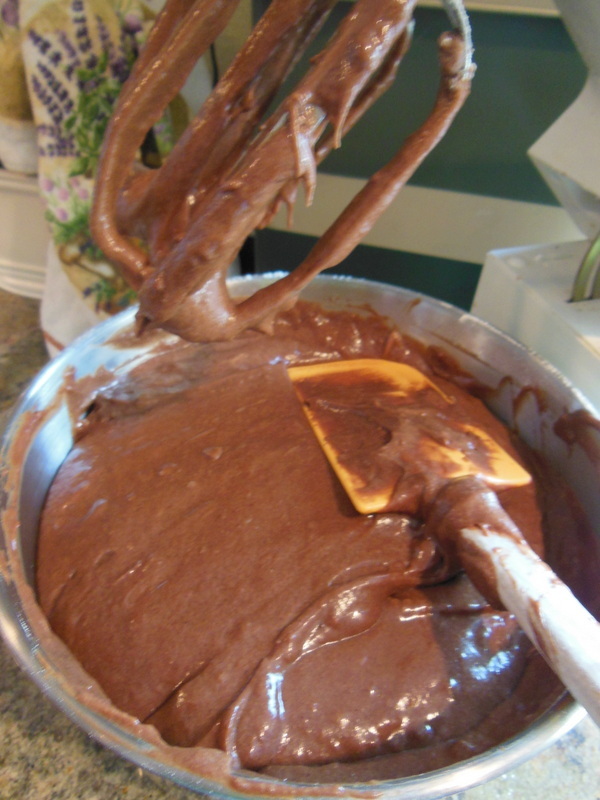 To this mixture I alternately added the dry ingredients and 1 cup of moscato, making sure to blend well after each addition. 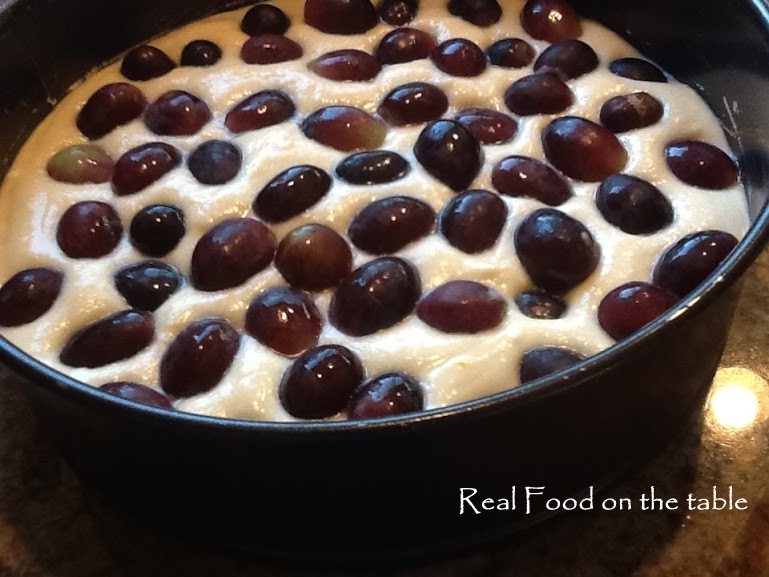 I poured the batter into my spring form pan, and then scattered my grapes over the top. I baked it at 400 degrees for about 20 minutes until the top was set. Then I dotted the top with butter and sprinkled with sugar and baked another 20 minutes. When it was golden I pulled it out of the oven and let it cool for about 20 more minutes before releasing it from the pan. The result was surprisingly good. 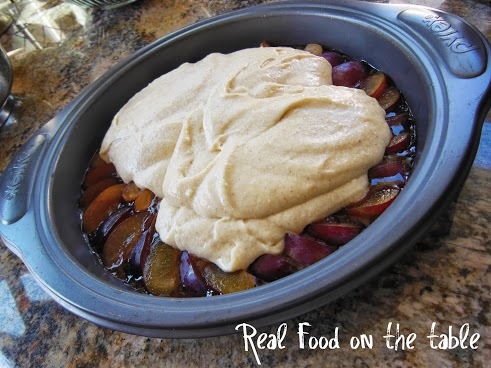 Kiddos claimed it tasted like baked apples (hmmmmmm?) Every last crumb was gone in one sitting. 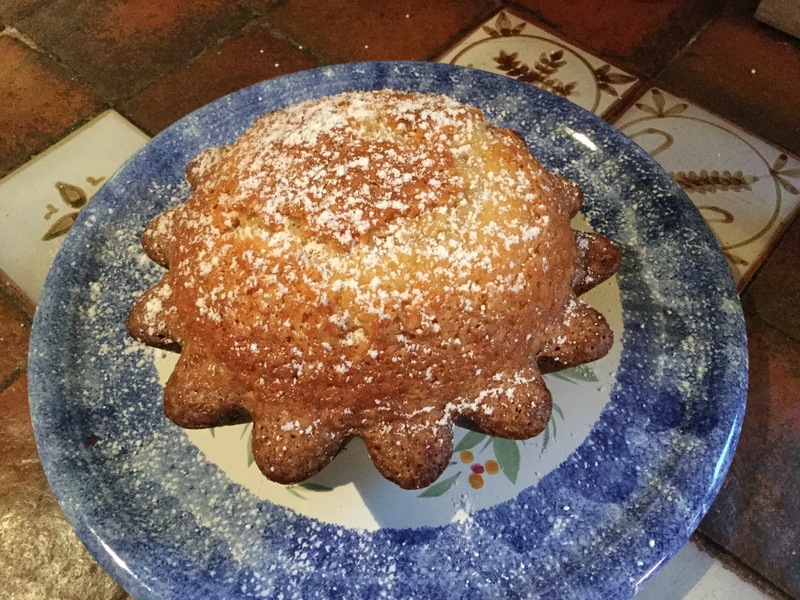 Even the Hubs, who generally isn’t a fan of any baked fruit, liked it. So chalk that one up to a new adventure . . . grapes in a cake, and some moscato to boot. Oh, and I feel so much better now that we had a chance to actually finish this conversation. 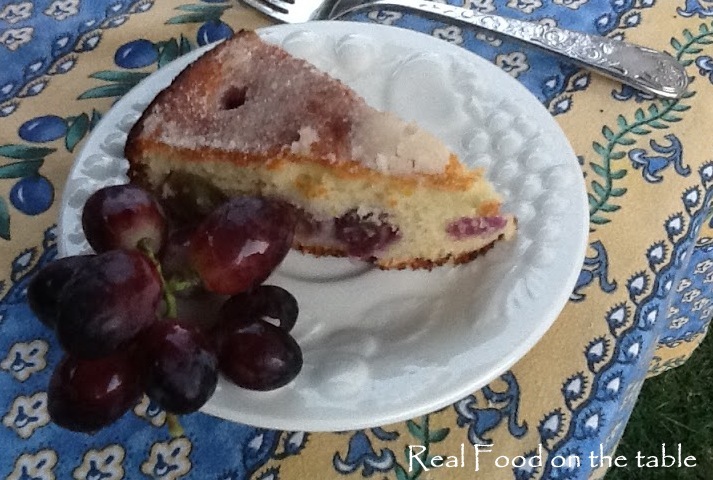 Here’s the complete recipe for Moscato Cake with Grapes, adapted from Epicurious. This week has had us running in a million different directions. I foolishly thought that with a little respite from water polo that I would have a few low-key, kick-back kind of days. Wrong. The Hubs non-chalantly announced at dinner on Sunday that there was an intensive soccer clinic going down this week and that Medium Little One would be there EVERY night. But at least our mornings have been much more relaxed than usual. We’ve eaten pancakes together, done puzzles, played Monopoly, played in the sand box, fiddled in “the garden”. So my confession is that I have to try really hard on those slow paced mornings. I guess it’s time to come to grips with the fact that I’m simply not a stay in my jammies and lounge kind of gal. I make it until about 10:30 and then it’s like something just flips inside of me. I myself need to shower and get dressed. I need my small people showered, dressed, and coiffed. And then I start looking around at the sheer mess resulting from our lounging and I freak. I start tasking out orders and our leisurely morning comes to a grinding halt. Oh, we may still have fun and relax over the course of the day, but that 10:30ish mark is just a breaking point for me. I need to know that “things are in order” and everyone has done what they need to do to start the day. Psychotic? Most definitely, but that’s just the way this girl is wired. All I can hope for is that my small people don’t undergo too much therapy later in life as a result of it. I can hear it now, “It was weird, we were having so much fun, playing Monopoly, when all of a sudden my mom’s head started spinning, her eyes rolled back in her head, and she started drilling out orders about everything that needed to be picked up, and gave us 10 minutes to get dressed and be presentable.” As I see it, I will have either created post-10:30-pajama-avoiders like myself, OR my progeny will be like those ones that you see in the bagel shop on Saturday morning living life in their PJs as if no one will notice or care. Usually, after we switch gears and get “presentable”, we also launch into some kind of productive activity. Yes, productivity will be a whole other topic for adult-life therapy. I just keep telling myself, there could be worse evils, right? 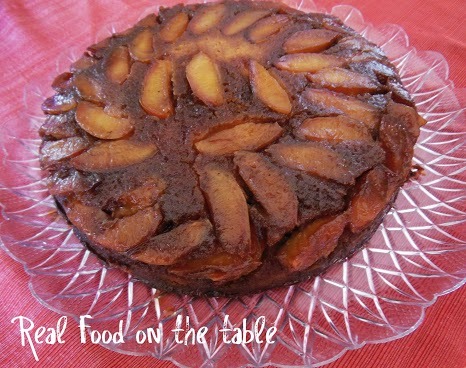 Anyway, this week, one of our productive activities together was to make this Plum Upside Down Cake. We bought a ton of plums and they all seemed to ripen at exactly the same time. Knowing we couldn’t possibly eat them all in time, I whipped out this recipe and off we went. 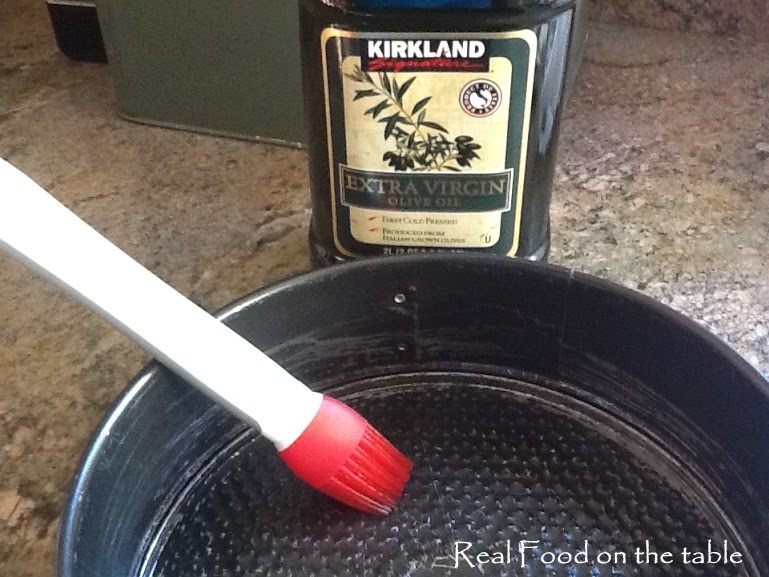 We started by mixing some butter, date palm sugar, and honey together in a skillet. The actual recipe called for brown sugar, but I was curious as to how the date palm sugar would substitute in. 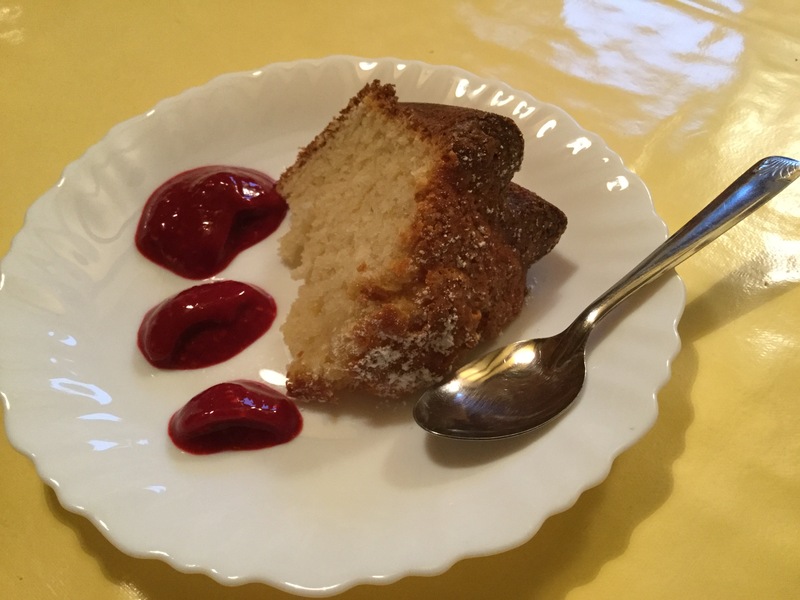 It didn’t melt as smoothly as brown sugar usually does, but the end result was just as good. 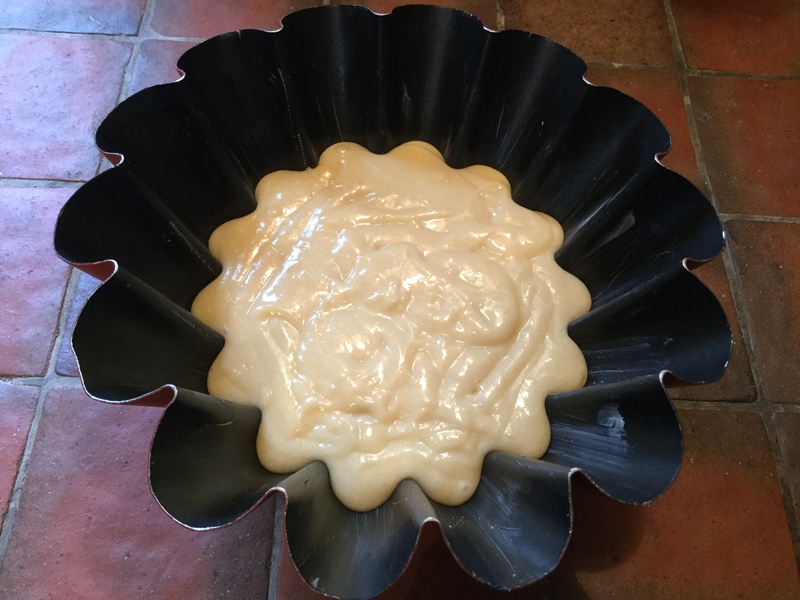 We poured that glaze into the bottom of a regular cake pan. Then I sliced up the plums into wedges and the little helping fingers arranged them in this lovely spiral pattern on top of the glaze. 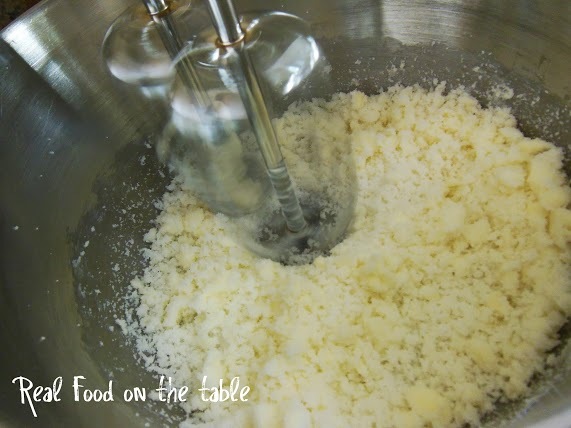 After that, we mixed together some butter and sugar with the electric mixer. 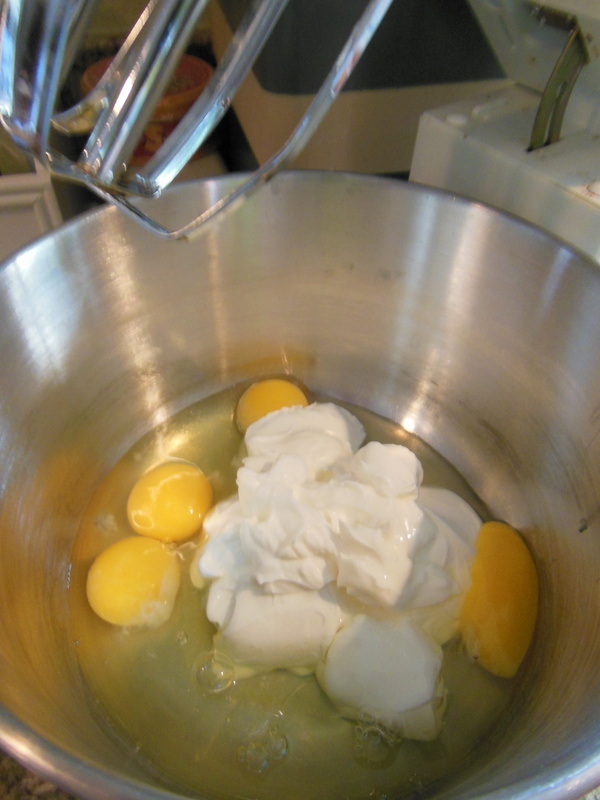 We added in a couple of eggs along with some almond extract and some vanilla. 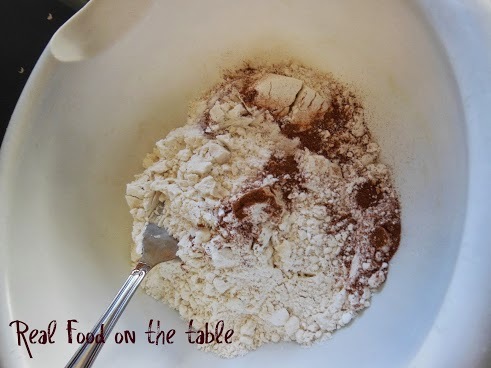 We mixed together the dry ingredients which included flour, baking powder, cinnamon, and salt. 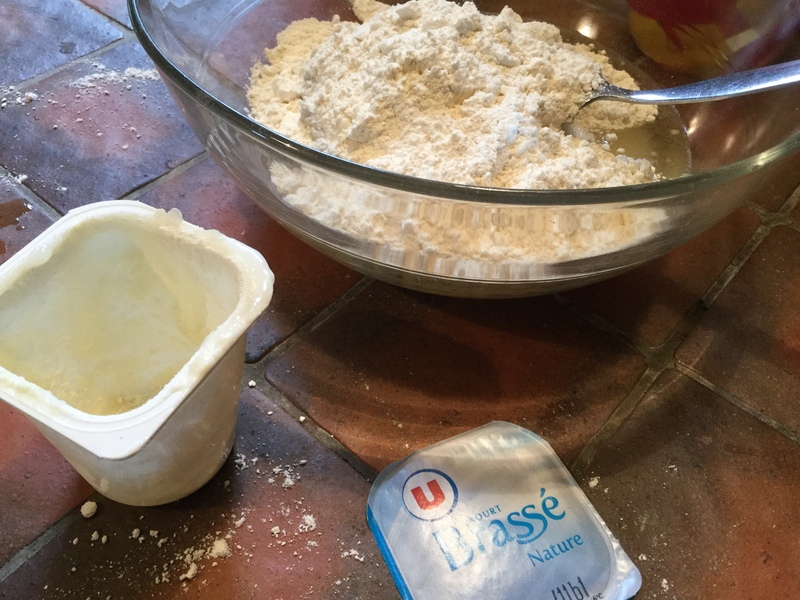 Then we alternated between adding the dry ingredients and milk to the butter and sugar mixture. 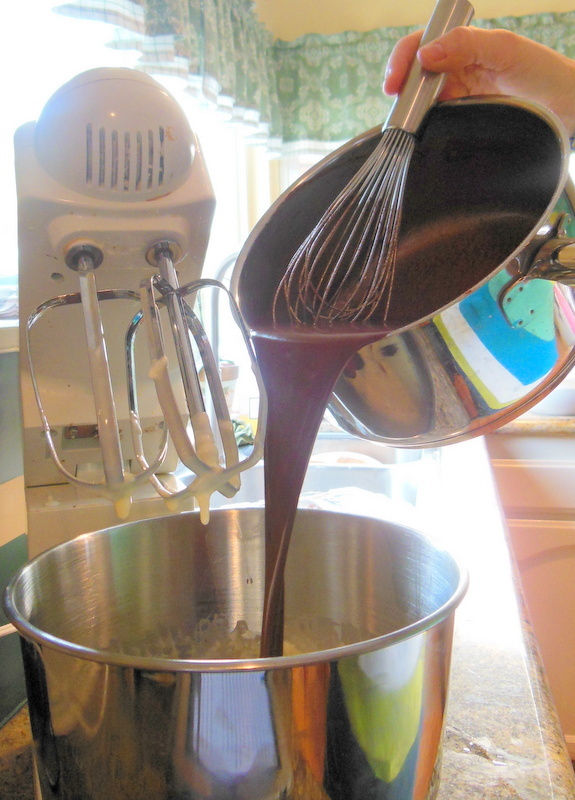 When the batter was done, we spread it over the top of the plum swirl. We popped it in a 350 degree oven and baked for about 55 minutes. We let it cool in the pan for 30 minutes after taking it out of the oven. We ran a knife around the edges of the pan to unstick the gooey glaze. Then we inverted a platter on top of it and flipped out the cake. It was surprisingly light and very tasty. 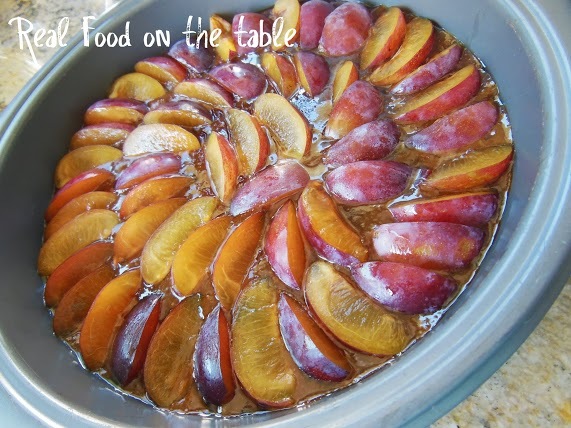 We are still staring at a good amount of very ripe plums, so we may just be looking at a repeat dessert another night this week, and another little “productive activity”. 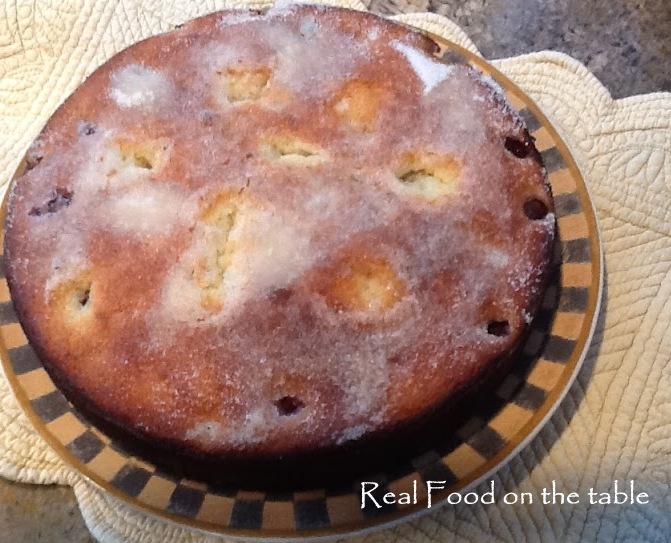 Here’s the complete recipe for Plum Upside Down Cake, adapted from Epicurious. Have your own supply of oh-so-ripe plums? 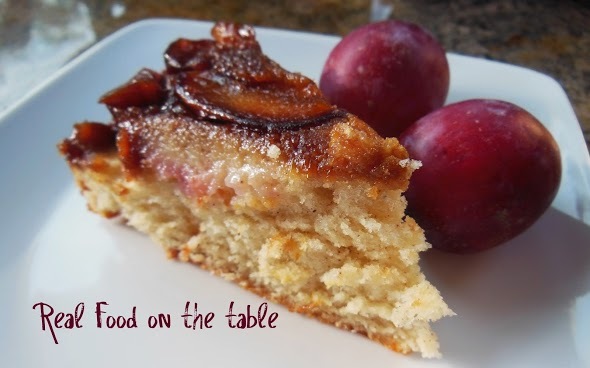 Check out these other plum dessert recipes. The saying is old and cliche, of course, but in last night’s endeavor, oh so true. For those of you who don’t know me personally, I was born and raised in Ohio AND in a non-foodie family (so, please don’t get in a bunch, beloved mid-west readers, This is more about my tribe of origin, than the region from which I hail.) In the culinary realm, this meant that: one of the highlights of Christmas was ham balls, I really believed that mayonnaise and condensed soups were their own food group, and jello (depending on the mold used) was an enviable dessert to bring to any potluck. I have now lived in California for 20 years. Living here, along with having lived in France for a year, has considerably redefined my take on eating. If you’ve read any other posts around here, you know that I’m about trying to eat “real” food. I am becoming more and more aware of the processed food predators that sneak into our diets. And I’m just grossed out by them. I adore Michael Pollan and his food musings. But I’m also not one of those people who gets so geared up and hog-wild overboard about something that I lose all perspective. 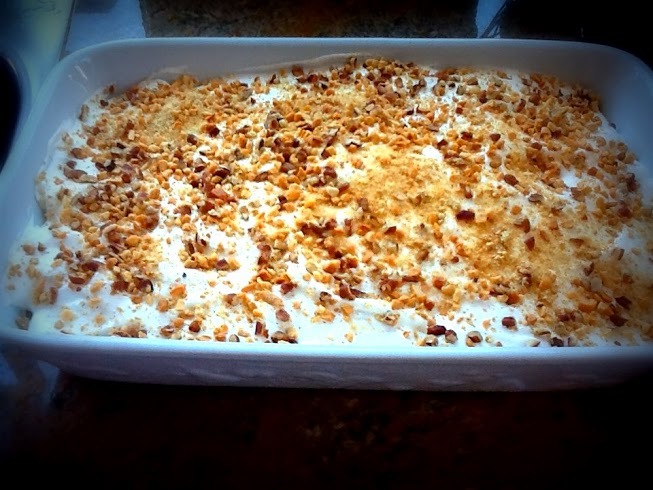 So excuse me for a moment, while I walk you through an old Ohio family favorite that I whipped up last night for a big Soccer Team Parent meeting that was going down at my house. A little number affectionately known as Banana Split Cake (I guess the banana is one healthy aspect of it!). 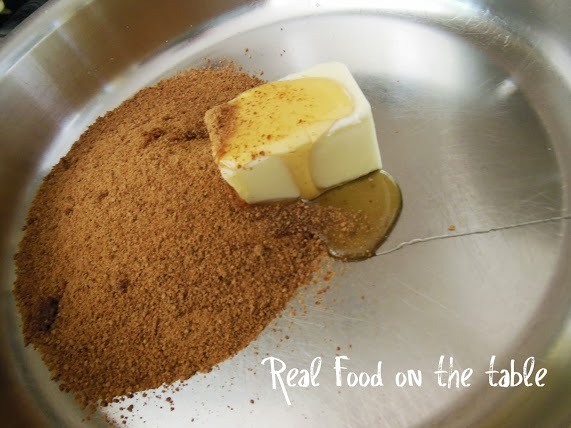 If you have happened on my blog and love it for the “real” food slant, please just plug your ears and hum as you read through this post, or click away now before the GMOs take center stage. 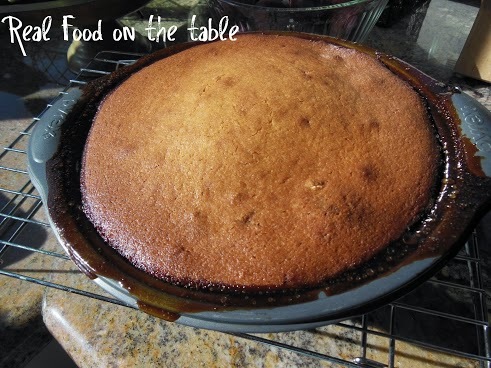 This lovely “cake” sits atop a graham cracker crust. That is – graham crackers hammered with a meat mallet (my preferred method) mixed with 1/2 c. of melted butter. In case that whopping amount of butter wasn’t enough of an artery clogger for you. 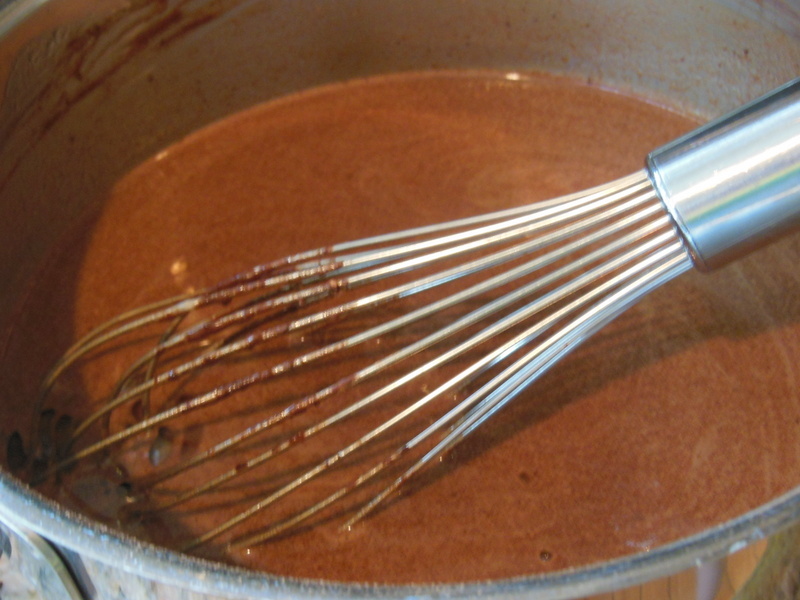 the filling consists of another 1 c. of softened butter, whipped together with 2 eggs and a 16 oz. box of powdered sugar. 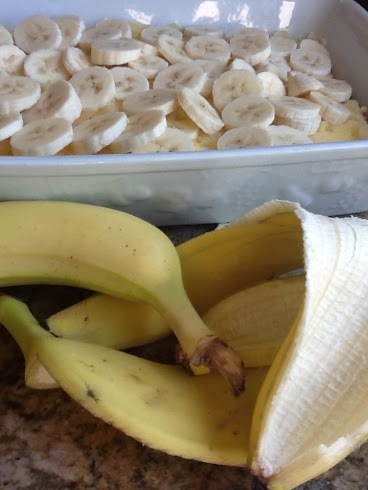 Slather that good old mess on top of the graham cracker crust and then layer with a can of crushed pineapple (drained) and sliced banana (hallelujah, a real food!). On top of that loveliness, spead a 12 oz. 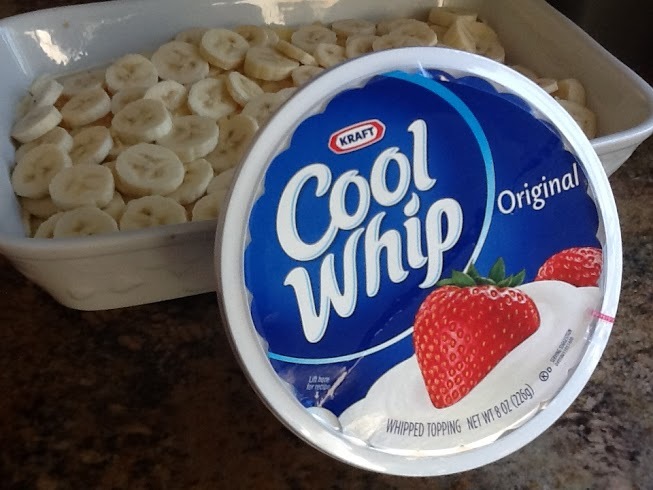 container of Cool Whip! Now, going back to that whole Michael Pollan thing, one of his more amusing food rules, in his book, Food Rules, is that you shouldn’t eat anything that your mother or grandmother wouldn’t recognize. 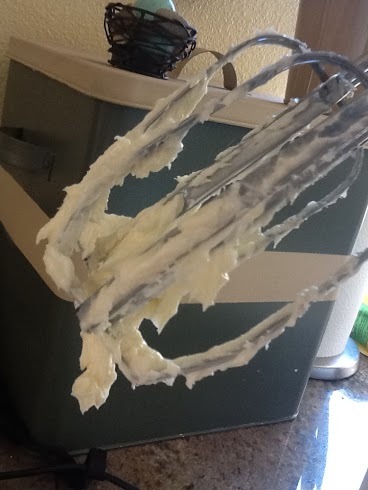 Well, I guess I’m not technically breaking the rule when stated that way, because my mom and grandma were both bosom buddies with Cool Whip. It made an appearance at just about EVERY family gathering- especially Thanksgiving where the bigger the dollop of Cool Whip, the better the pumpkin pie. You are now ready for the finishing touch which consists of either more sprinkling of graham cracker crumbs or chopped nuts. I went whole hog and decided on BOTH! A least an hour of refrigeration makes this ready to eat. The good news is that the soccer parents didn’t thumb their noses at me for serving such a “processed” dessert. I think we’re all still friends. The banana split cake disappeared with many having seconds and some (we won’t mention names) even thirds. 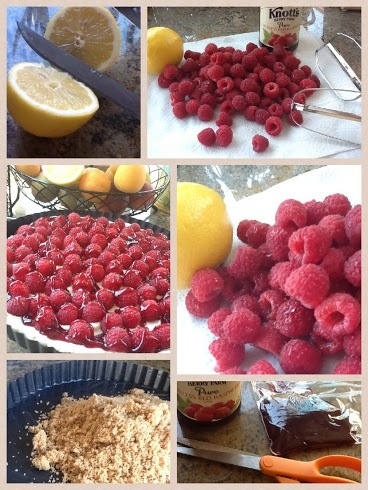 Confession though, I did make a little more “refined” raspberry tart to serve with the banana split cake just to even the balance a bit. Won’t detail out the creation of that one, but will just offer up a walk through of images. Ok, if you opted to plug your ears and hum, you can unplug them now. Did I mention I made a sweet potato and zucchini frittata, containing only real food, for dinner?